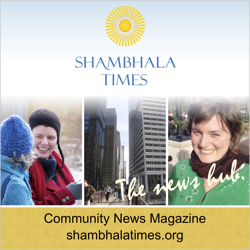 A community event for Shambhala members and newcomers—please invite your friends! Each week, a presenter from the community wil lead a discussion on a contemporary topic of concern and inspiration. Includes meditation instruction, meditation practice, and a social reception. Come engage, practice and mingle—a perfect way to start the week! Every Monday from 7-9pm, drop-in and free. Let us know what kinds of topics you'd like to discuss during a Monday Night Community Gathering, and we will see if we can find a presenter to match that request. Let us know if you'd like to offer a presentation during a Monday Night Community Gathering! This gem of Buddhist wisdom comes to us from the Indian teacher Atisha, who lived about a millennium ago. The saying is meant to be contemplated, internalized and then recalled during daily life. We will explore how this awareness practice could help reduce stress and make us more pliable and relaxed. And more profoundly, we'll investigate how it can help us move toward the wisdom that penetrates the nature of reality. Please join us for an evening of exploring an alternate reality! Shastri Angelika Behrooz was introduced to meditation in 1987. Since then the practice and study of Shambhala Buddhism has been her main passion. She has accomplished many group and solitary retreats and in the late 1990s started to guide and teach students. In her professional life as a PhD physicist she engaged in research and many years of teaching. She now owns a bookstore with her husband. Some questions we will contemplate and discuss are: "What is the relationship of mindfulness/awareness to making art, participating in art, or appreciating art? Where do art and dharma converge? Diverge? Is there a role for art in social transformation?" Wendell Beavers and Erika Berland have danced together and apart, professionally and for fun, since 1989. They have worked closely together since 2004 on the creation and sustaining of Naropa University’s MFA Theater: Contemporary Performance program. Erika Berland is a senior teacher in the Shambhala Buddhist lineage, a licensed massage therapist, a Certified Practitioner of Body-Mind Centering®, a somatic movement teacher, and an author. She has contributed chapters to recent publications on movement training for actors and is the author of Sitting: The Physical Art of Meditation. Wendell Beavers, choreographer, director and performer, is Professor Emeritus of Performing Arts at Naropa University. He founded the MFA Theater program at Naropa in 2004. He was a founding faculty and Director of NYU’s Experimental Theater Wing 1978–2003. He has been a practitioner of Shambhala Buddhism since 1985.